Not to be confused with Tomatin or thaumatin. Tomatine (sometimes called tomatin or lycopersicin) is a glycoalkaloid, found in the stems and leaves of tomato plants, and in the fruits at much lower concentrations. It has fungicidal, antimicrobial, and insecticidal properties. Chemically pure tomatine is a white crystalline solid at standard temperature and pressure. Tomatine, as well as the closely related aglycon (or aglycone) derivative tomatidine have been shown to have multiple health benefits. Tomatine is sometimes confused with the glycoalkaloid solanine, which is found in potatoes. Tomatoes were brought to Europe in the early 1500s. The English botanist John Gerard was one of the first cultivators of the tomato plant. In his publication Grete Herball, he considered tomatoes as poisonous due to their levels of what would later be called tomatine, plus high acid content. Consequently, tomatoes were generally not eaten in Britain until the mid-18th century. In 1837, the first medicinal tomato pills were advertised in the United States because of their positive effects upon the biliary organs. The product “Phelp’s Compound Tomato Pills” was extracted from the tomato plant, and contained tomatine. The pills were made by the medic Guy R. Phelps, who stated that the alkaloid tomatine was one of the most useful discoveries ever made. Tomatine then was said to be an antidote to mercury. In the mid 20th century, scientists from the US Department of Agriculture were the first to isolate tomatine from the wild tomato species Lycopersicon pimpinelifolium and the cultured species Lycopersicon esculentum. Figure 1: Biosynthesis of α-tomatine (26) and other steroidal glycoalkaloids in Solanaceae species. Alpha-tomatine (α-tomatine) belongs to the compound group steroidal glycoalkaloids. These compounds consist of an aglycon, which is a cholesterol derivative, and a carbohydrate chain, which in the case of α-tomatine consists of two d-glucose units, a d-galactose unit, and a d-xylose unit. In α-tomatine, the tetrasaccharide called lycotetraose is attached to the O-3 of the steroidal aglycone. At first it was thought that the synthesis of steroidal alkaloids only involved multiple steps of hydroxylation, oxidation and amination of cholesterol with arginine as the source of the incorporated nitrogen. Later the glycoalkaloid metabolism genes were discovered. These genes produce the glycoalkaloid metabolism enzymes, which are responsible for the synthesis of steroidal alkaloid aglycones in potato and tomato plants. 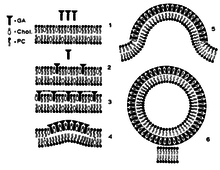 The reaction these enzymes perform are shown in the figure 1. Tomatine may play a major role in resistance of the tomato plant against fungal, microbial, insect, and herbivoral attack. The effects of the glycoalkaloids (to which tomatine belongs), can be divided in two main parts: the disruption of cellular membranes and the inhibition of the enzyme acetylcholinesterase. Tomatine is responsible in tomato plants for resistance against for example the Colorado beetle and to snails. It is also a defense against fungi. The membrane disruptive properties of tomatine are caused by the ability to form 1:1 complexes with cholesterol. A possible mechanism of the membrane disruption by glycoalkaloids is displayed in figure 2. First, the aglycon part of tomatine binds reversible to sterols in the membrane (figure 2, part 2). When this reaches a certain density, the glycosidic residues of the glycoalkaloids interact with each other by electrostatic interactions. This interaction catalyzes the development of an irreversible matrix of glycoalkaloid-sterol complexes (figure 2, part 4). In this way, the sterols from the external membrane are immobilized and membrane budding will arise. Tubular structures are formed, because of the structure of tomatine (figure 2, part 6). This membrane disruption causes cell death by cell leakage. Also, the disrupted membrane has an influence on sodium transport, by altering the membrane potential and reducing active sodium transport. When tomatine is orally ingested, the brush border of the intestine is damaged by the membrane-disruptive properties of tomatine, so increased uptake of macromolecules occurs. This damage to the epithelial barriers is dose-dependent. Tomatine is considered to be a fungitoxic compound, as it completely inhibits mycelial growth of the fungi C. orbiculare (MC100=2.0 mM), S. linicola (MC100=0.4 mM), and H. turcicum (MC100=0.13 mM). For the inhibition at a low pH, much more tomatine is required, so the compound is more effectively fungitoxic at a high pH, when the alkaloid is unprotonated. The unprotonated form of tomatine forms complexes with sterols such as cholesterol, which may cause disruption of cell membrane and changes in membrane permeability. Research has proven that tomatine is only effective against fungi at pH 8 and not at pH 4. A possible explanation for this is that the tomatine only in the deprotonated form binds to cholesterol]to form the earlier mentioned complexes. Other research has proven that tomatine disrupts liposome membranes containing 3-ß-hydroxy sterol, while liposomes without 3-ß-hydroxy sterols are resistant to membrane disruption. Tomatine inhibits also the fungal types Ph. infestans and Py. aphanidermatum, which do not have any sterols in their membranes, so another mechanism of action must be present. The other known mechanism of action is the pH-dependent competitive inhibition of the enzyme acetylcholinesterase. The neurotransmitter acetylcholine plays a role in the transmission of signals from neurons to muscles. It is released from the neuron, and binds to the muscular membrane, causing depolarization and muscle action. To allow a new signal to be received, the released acetylcholine should be broken down, by the enzyme acetylcholinesterase. If acetylcholinesterase is inhibited, the released acetylcholine cannot be broken down, and stays in the neuromuscular junction and in the synapses in the central nervous system, inhibiting further transmission of nervous signals. Also a reversible inhibition of butyrylcholinesterase can take place. The function of butyrylcholinesterase is not fully understood, but it probably plays a role in cell growth. The majority of synthetic pesticides used in agriculture work by inhibition of acetylcholinesterase, to kill insects. There are further mechanisms by which tomatine can have effects on organisms. In a research on frogs, oral administration of low-concentration tomatine has a cationic effect on cardiac contractions. It is possible that the increased heart rate comes from alteration of the electric properties of heart cell membranes by positively charged tomatine ions, because of participation in acid-base equilibriums. Tomatine can also stimulate the immune system by participation in a sequence of the respiratory burst. This provides cellular release of hydrogen peroxide, which is an immune modulator. The respiratory burst uses peroxide to form hypochlorite, which in turn destroys bacteria. The mechanism of action against cancer cells is not fully understood. It may be a result of the different earlier mentioned molecular interactions, as complexing with cholesterol, potentiation of the immune system and direct destruction by disruption of the cell membranes. In the case of cancer, also inhibition of invasion and migration is found. The mechanism for this is maybe through inactivation of PI3K/Akt of ERK signaling pathways, which inhibits transcriptional factors and DNA binding activities. This inhibition leads to decrease in MMP-2, MMP-9 and u-PA. MMP-2, MMP-9 and u-PA are factors which are important in the metastasis of the cancer, by inhibiting this factors, the ability of the cancer to spread around the body is reduced. Even now, little is known about the bioavailability, pharmacokinetics and metabolism of the glycoalkaloids in humans. One important factor is the poor uptake of tomatine into general blood circulation. When tomatine is orally ingested, much tomatine may form complexes with cholesterol from the other food present in the stomach. The complexes of tomatine and cholesterol are not absorbed in the intestine, but are excreted. For the complexation with cholesterol to occur, the presence of a carbohydrate chain is essential. The aglycon tomatidine, which is tomatine without the sugars, does not form the complexes. The complexation probably occurs in the duodenum, because the acidic conditions in the stomach itself lead to protonation of the tomatine, and the protonated form of tomatine does not bind to cholesterol. Hydrolysis of tomatine likely takes place, but whether it is acid- or glycosidase-catalyzed is not known. In vitro exposure of tomatine to 1 M HCl for 3 hours at 37 °C (99 °F) did not hydrolyze tomatine, so probably the tomatine is also not hydrolyzed by acid in the digestive tract of humans. The hydroxylation of tomatine likely leads to the formation of tomatidine, which is the aglycon of tomatine. Tomatidine is a metabolite which may not be completely nontoxic; it could have effects on the human body. Fungal tomatinase enzymes can transform tomatine to deactivate it. Detoxification can take place by removing one glucose residue. Other fungal species hydrolyze tomatine to the less toxic aglycon tomatidine by removing all the sugar residues. Tomatidine can still inhibit some fungal species, but is less toxic than tomatine. The metabolic pathway of hydrolysis of tomatine is different for different types of fungi. Also, the level of toxicity depends on the type of fungus. The metabolite tomatidine can be hydrolyzed further by membrane-bound CYP-450 oxygenases. Tomatine has been used as a reagent in analytical chemistry for precipitating cholesterol from solution. Also, tomatine is known to be an immune adjuvant in connection with certain protein antigens. Studies showed that the molecule possesses antibiotic properties against the human pathogens E.coli and Staphylococcus aureus, and a variety of fungi. The presence of sterols in cell membranes of fungi and other pathogens makes it possible for glycoalkaloids to form complexes with sterols. Such binding results in the disruption of cell membranes, leakage of cell components and finally cell death. Tomatidine is a natural small molecule inhibitor of skeletal muscle atrophy, and a potential therapeutic agent for aging-associated sarcopenia, reducing weakness and atrophy in aged skeletal muscle. Dietary supplementation with ∼0.04% tomatidine for 10 weeks reduces plasma cholesterol and atherosclerosis in ApoE-deficient mice without evidence of toxicity. Tomatine has antimicrobial properties against certain classes of microbes although some microbes produce an enzyme called tomatinase which can degrade tomatine, rendering it ineffective as an antimicrobial. In vitro studies showed that tomatine increased the permeability of the small intestinal mucosal cell, resulting in inhibition of active nutrient transport, and facilitation of the uptake of gut contents that normally would not be absorbed. Oral administration of tomatine to frogs induces a cationic effect on cardiac contraction, producing symptoms of tachycardia. Injection of tomatine into mice caused a rapid drop in blood pressure. This is presumably the result of tomatine-induced disruption of red blood cell membranes. (Cholesterol seems to protect the erythrocytes. Intraperitoneal injection of tomatine results in a decrease of diuresis in rats. This effect is accompanied by increased corticosteroid and neutrophil levels and a decrease in the Na/K ratio in the serum. The oral administration of tomatine in doses of 15–30 mg/kg or the intramuscular administration in the dose range of 1–10 mg/kg induces a dose-dependent inhibition of induced edema similar anti-inflammatory effects are noted when tomatine is administered subcutaneously. According to in vivo studies with mice, rats and hamsters, tomatine seems to be non-toxic when orally consumed (LD50=500 mg/kg). Complex formation may be the reason why tomatine has a much lower oral toxicity than other glycoalkaloids. Due to formation of insoluble complexes with sterols, tomatine is eliminated in the feces and only small amounts of tomatine are absorbed by the digestive tract. The amount of plasma LDL cholesterol (low-density lipoprotein) decreases as the amount of dietary tomatine increases. The LD50 value of tomatine when served intravenous is determined to be 18 mg/kg body weight. When administered intraperitoneally, the LD50 value is equal to 25 mg/kg body weight. Generally, tomatine is less toxic than potato glycoalkaloids. The influence of tomatine on rat hearts has been studied by adding the compound to a culture medium of neonatal rat cells. At a concentration of 20 µg/ml tomatine the contraction frequency increased within two hours. At a concentration of 40 µg/ml tomatine the heart cells stopped beating for some minutes. The effects of tomatine on frog embryos and frog skin were tested by fluorescence measurements. The membrane permeability of frog embryos increased by 600% when exposed with tomatine. In frog skin, the sodium-active transport decreased by 16%, which may lead to disruption of cell membranes. Direct injection of tomatine into mice also causes an increase in blood pressure due to hemolysis, and calcium release from bone tissue. When administered intramuscularly or orally to rats, tomatine inhibits induced edema. The possible risks of tomatine for humans have not been formally studied, so no NOAEL can be deduced. The toxicity of tomatine has only been studied on laboratory animals. The symptoms of acute tomatine poisoning in animals are similar to the symptoms of poisoning by solanine, a potato glycoalkaloid. These symptoms include vomiting, diarrhea, abdominal pain, drowsiness, confusion, weakness, and depression. Generally, tomatine is regarded to cause less toxic effects to mammals than other alkaloids such as solanine. The amount of tomatine absorbed by the human body as well as the possible metabolism is unknown. There is no evidence that consumption of tomatoes causes acute toxic or genotoxic effects. The human consumption of moderate amounts of tomatine seems to occur without notable toxic effects. This is reinforced by the widespread consumption of “pickled green” and “fried green tomatoes” and the consumption of high-tomatine tomatoes (a variant of L. esculentum var. cerasiforme, better known as the "cherry tomato", indigenous to Peru) with very high tomatine content (in the range of 500–5000 mg/kg of dry weight). New York Times food science writer Harold McGee has found scant evidence for tomato toxicity in the medical and veterinary literature, and observes that dried tomato leaves (which contain higher concentrations of alkaloids than the fruits) are occasionally used as a food flavoring or garnish, without problems. He also reports that an adult human would probably have to eat over a pound of tomato leaves to ingest a toxic (not necessarily lethal) dose. ^ a b EBI Web Team. "tomatine (CHEBI:9630)". ^ Degtyarenko, K.; De Matos, P.; Ennis, M.; Hastings, J.; Zbinden, M.; McNaught, A.; Alcantara, R.; Darsow, M.; Guedj, M.; Ashburner, M. (2007). "ChEBI: A database and ontology for chemical entities of biological interest". Nucleic Acids Research. 36 (Database issue): D344–50. doi:10.1093/nar/gkm791. PMC 2238832. PMID 17932057. ^ Friedman, Mendel (2013). "Anticarcinogenic, Cardioprotective, and Other Health Benefits of Tomato Compounds Lycopene, α-Tomatine, and Tomatidine in Pure Form and in Fresh and Processed Tomatoes". Journal of Agricultural and Food Chemistry. 61 (40): 9534–50. doi:10.1021/jf402654e. PMID 24079774. ^ a b McGee, Harold (July 29, 2009). "Accused, Yes, but Probably Not a Killer". The New York Times. Retrieved 2016-11-03. ^ "Tomatoes Culinary History – Resource – Smart Kitchen – Online Cooking School". ^ Andrew F. Smith; The tomato in America: Early History, Culture, and Cookery; University of South Carolina Press, 1994; 112. ^ Fontaine, T. D.; Irving, G. W., Jr.; Ma, R.; Poole, J. B.; Doolittle, S. P; Isolation and partial characterization of crystalline tomatine, an antibiotic agent from the tomato plant; Arch. Biochem. 1948; 18, 467-475. ^ Fontaine, T. D., Ard, J. S., Ma, R. M.; Tomatidine, a steroid secondary amine; J. Am. Chem. SOC, 1951; 73, 878-879. ^ a b Cárdenas, P.D. ; Sonawane, P.D. ; Heinig, U.; Bocobza, S.E. ; Burdman, S.; Aharoni, A. (2015). "The bitter side of the nightshades: Genomics drives discovery in Solanaceae steroidal alkaloid metabolism". Phytochemistry. 113: 24–32. doi:10.1016/j.phytochem.2014.12.010. PMID 25556315. ^ a b c Cárdenas, P.D. ; Sonawane, P.D. ; Heinig, U.; Bocobza, S.E. ; Burdman, S.; Aharoni, A. (2015). "The bitter side of the nightshades: Genomics drives discovery in Solanaceae steroidal alkaloid metabolism". Phytochemistry. 113: 24–32. doi:10.1016/j.phytochem.2014.12.010. PMID 25556315. ^ Jones, Nigel A.; Nepogodiev, Sergey A.; Field, Robert A. (2005). "Efficient synthesis of methyl lycotetraoside, the tetrasaccharide constituent of the tomato defence glycoalkaloid α-tomatine". Organic & Biomolecular Chemistry. 3 (17): 3201–6. doi:10.1039/B508752J. PMID 16106302. ^ a b c d e f g h i Milner, Sinead Eileen, et al. "Bioactivities of glycoalkaloids and their aglycones from Solanum species." Journal of agricultural and food chemistry 59.8 (2011): 3454-3484. ^ a b c d e f g h i j k l m n o p q Friedman, Mendel; Tomato glycoalkaloids: role in the plant and in the diet; Journal of Agricultural and Food Chemistry 50.21, 2002; 5751-5780. ^ a b c Hoagland, Robert E.; Toxicity of tomatine and tomatidine on weeds, crops and phytopathogenetic fungi. ; Allelopathy J 23.2, 2009; 425-436. ^ a b c Keukens, Erik AJ, et al; Dual specificity of sterol-mediated glycoalkaloid induced membrane disruption; Biochimica et Biophysica Acta (BBA) - Biomembranes 1110.2, 1992; 127-136. ^ Arneson, P.A., Durbin, R.D. ; Studies on the Mode of Action of Tomatine as a Fungitoxic Agent. ; USDA Pioneering Research Laboratory, 1967. ^ a b c d Andersson, Christer. ; Glycoalkaloids in tomatoes, eggplants, pepper and two Solanum species growing wild in the Nordic countries. ; Nordic Council of Ministers, 1999. ^ Mook, Olaf RF, Wilma M. Frederiks, and Cornelis JF Van Noorden. ; The role of gelatinases in colorectal cancer progression and metastasis. ; Biochimica et Biophysica Acta (BBA) - Reviews on Cancer 1705.2, 2004; 69-89. ^ Arneson, P. A., and R. D. Durbin. ; Studies on the mode of action of tomatine as a fungitoxic agent. ; Plant physiology 43.5, 1968; 683-686. ^ Cayen, M. N. (1971). "Effect of dietary tomatine on cholesterol metabolism in the rat". Journal of Lipid Research. 12 (4): 482–90. PMID 4362143. ^ Heal, K. G.; Taylor-Robinson, A. W. (2010). "Tomatine Adjuvantation of Protective Immunity to a Major Pre-erythrocytic Vaccine Candidate of Malaria is Mediated via CD8+ T Cell Release of IFN-γ". Journal of Biomedicine and Biotechnology. 2010: 834326. doi:10.1155/2010/834326. PMC 2837906. PMID 20300588. ^ Fontaine, T. D., Irving, G. W., Jr., Ma, R. M., Poole, J. B., Doolittle, S. P.; Isolation and partial characterization of crystalline tomatine, an antibiotic agent form the tomato plant; Arch. Biochem., 1948; 18, 467-475. ^ Kuhn, R., Lo ¨w, I., Trischmann, H.; The constitution of lycotetraose; Chem. Ber., 1957; 90, 208-213. ^ Kuhn, R., Lo ¨w, I., Trischmann, H; The constitution of tomatine; Angew. Chem., 1956; 68, 212. ^ Irving, G. W., Jr., The significance of tomatine in plant and animal disease; J. Wash. Acad. Sci., 1947; 37, 467-475. ^ Blankemeyer, J. T., McWilliams, M. L., Rayburn, J. R., Weissenberg, M., Friedman, M.; Developmental toxicology of solamargine and solasonine glycoalkaloids in frog embryos; Food Chem. Toxicol., 1998; 36, 383-389. ^ Dyle, M. C.; Ebert, S. M.; Cook, D. P.; Kunkel, S. D.; Fox, D. K.; Bongers, K. S.; Bullard, S. A.; Dierdorff, J. M.; Adams, C. M. (2014). "Systems-based Discovery of Tomatidine as a Natural Small Molecule Inhibitor of Skeletal Muscle Atrophy". Journal of Biological Chemistry. 289 (21): 14913–14924. doi:10.1074/jbc.M114.556241. PMC 4031541. PMID 24719321. ^ Ebert, S. M.; Dyle, M. C.; Bullard, S. A.; Dierdorff, J. M.; Murry, D. J.; Fox, D. K.; Bongers, K. S.; Lira, V. A.; Meyerholz, D. K.; Talley, J. J.; Adams, C. M. (2015). "Identification and Small Molecule Inhibition of an Activating Transcription Factor 4 (ATF4)-dependent Pathway to Age-related Skeletal Muscle Weakness and Atrophy". Journal of Biological Chemistry. 290 (42): 25497–25511. doi:10.1074/jbc.M115.681445. PMC 4646196. PMID 26338703. ^ Fujiwara, Y; Kiyota, N; Tsurushima, K; Yoshitomi, M; Horlad, H; Ikeda, T; Nohara, T; Takeya, M; Nagai, R (2012). "Tomatidine, a tomato sapogenol, ameliorates hyperlipidemia and atherosclerosis in apoE-deficient mice by inhibiting acyl-CoA:cholesterol acyl-transferase (ACAT)". Journal of Agricultural and Food Chemistry. 60 (10): 2472–9. doi:10.1021/jf204197r. PMID 22224814. ^ Seipke, Ryan F.; Loria, Rosemary (2008). "Streptomyces scabies 87-22 Possesses a Functional Tomatinase". Journal of Bacteriology. 190 (23): 7684–92. doi:10.1128/JB.01010-08. PMC 2583622. PMID 18835993. ^ Johnson, I. T., Gee, J. M., Price, K., Curl, C., Fenwick, G. R.; Influence of saponins on gut permeability and active nutrient transport in vitro; J. Nutr., 1986; 116, 2270–2277. ^ Nishie, K., Fitzpatrick, T. J., Swain, A. P., Keyl, A. C.; Positive inotropic action of Solanaceae glycoalkaloids; Res. Commun. Chem. Pathol. Pharmacol., 1976; 15, 601-607. ^ Schloesser, E.; Role of saponins in antifungal resistance. IV. Tomatine-dependent development of fruit rot organism of tomato fruits. ; Acta Phytopathol., 1975; 10, 77-87. ^ Elferink, J. G. R.; The hemolytic action of saponins. ; Pharm.Weekbl., 1977; 112, 1-10. ^ a b Sackmann, W.; Kern, H., Wiesmann, E.; Studies on the biological effects of solanine and tomatine. ; Schweiz. Z. Allg. Pathol. Bakteriol., 1959; 22, 557-563. ^ Cayen, M.N. ; Effect of dietary tomatine on cholesterol metabolism in the rat; Journal of Lipid Research, Volume 12, 1971. ^ a b Wilson R. H., Poley G. W. and DeEds F.; Some pharmacologic and toxicologic properties of tomatine and its derivatives. ; Toxicology and Applied Pharmacology 3, 1961; 39-48. ^ Friedman, M., Fitch, T.E., Yokoyama, W.E. ; Lowering of plasma LDL cholesterol in hamsters by the tomato glycoalkaloid tomatine; Division of Agricultural and Food Chemistry, 1997. ^ Bergers, W.A., Alink, G.M. ; Toxic effect of the glycoalkaloids solanine and tomatine on cultured neonatal rat heart cells; Toxicology Letters, 1980; 6, 29-32. ^ Blankemeyer, J.T., White, J.B., Stringer, Friedman, M.; Effect of α-tomatine and tomatidine on membrane potential of frog embryos and active transport of ions in frog skin. ; Food and Chemical Toxicology, 1997; 35, 639-646. ^ Morris, S.C., Lee, T.H; The toxicity and teratogenicity of Solanaceae glycoalkaloids, particularly those of the potato (Solanum tuberosum): a review. ; Food Techn. Aust., 1984; 118-124. ^ Rick, C. M.; Uhlig, J. W.; Jones, A. D. (1994). "High alpha-tomatine content in ripe fruit of Andean Lycopersicon esculentum var. Cerasiforme: Developmental and genetic aspects". Proceedings of the National Academy of Sciences of the United States of America. 91 (26): 12877–12881. Bibcode:1994PNAS...9112877R. doi:10.1073/pnas.91.26.12877. PMC 45543. PMID 7809139. ^ Rick, C. M., Uhlig, J. W., Jones, A. D.; High R-tomatine content in ripe fruit of Andean Lycopersicon esculentum Var. cerasiforme: developmental and genetic aspects. ; Proc. Natl. Acad. Sci., 1994; 91, 12877-12881.